Since the beginning of the Al Aqsa Intifada, many Israeli activists – in growing numbers – appalled by what their government was doing in their name, have joined the weekly unarmed and non-violent demonstrations and activities in the Occupied West Bank, standing together with Palestinians to reject the Zionist state’s land theft, violence, occupation and apartheid policies. This forum on Co-Resistance and the Joint Popular Struggle in Palestine will be a discussion with Inbal Sinai, an Arab Jewish activist from Israel who is currently visiting Australia. 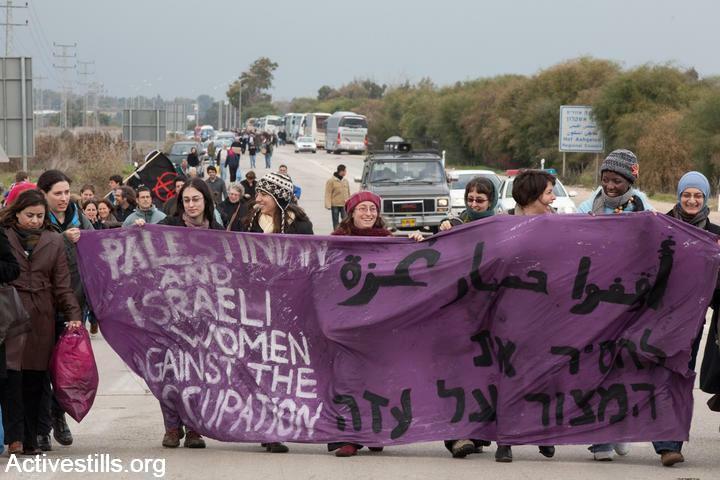 Inbal is a long time activist who has been involved with the Israeli Anarchists Against the Wall, the Sheikh Jarrah Solidarity movement and in the campaign in solidarity with Palestinian villages in the South Hebron Hills, which are constantly under attack by illegal Israeli settlers. Inbal was also active in the J14 movement in Israel. We invite you to join Inbal for a discussion on the issues of joint Palestinian-Israeli popular struggle and “anti-normalisation” campaigning, Israel’s ongoing military occupation and Israeli support for the Palestinian initiated BDS campaign. Inbal will give a short presentation and then the meeting will be open for questions, discussion and the sharing of ideas on how we can cooperate and work together on campaigns in support of the Palestinian people. 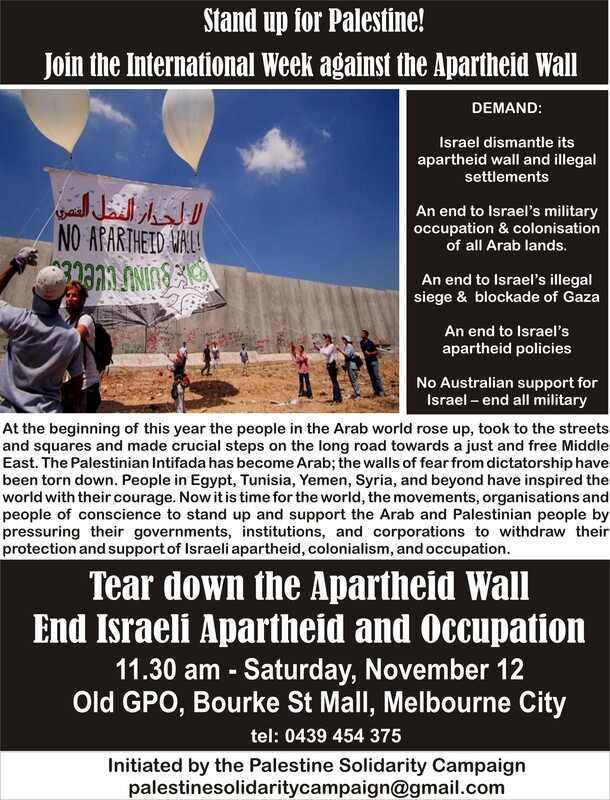 On November 12, as part of the 9th annual international week against the apartheid wall, the Palestine Solidarity Campaign in Melbourne took to the streets to raise awareness about Israel’s occupation and apartheid policies. In November 2000 Israel approved the first project to build a so- called “security barrier” — a 8 metre high wall (twice the height of the Berlin Wall), with watch towers, electric fences, concrete walls, trenches, sensors and military patrols. Israeli apartheid wall cuts deep into the Occupied West Bank, expanding Israel’s theft of Palestinian land and resources. In total, 85% of the Wall is located in the West Bank. 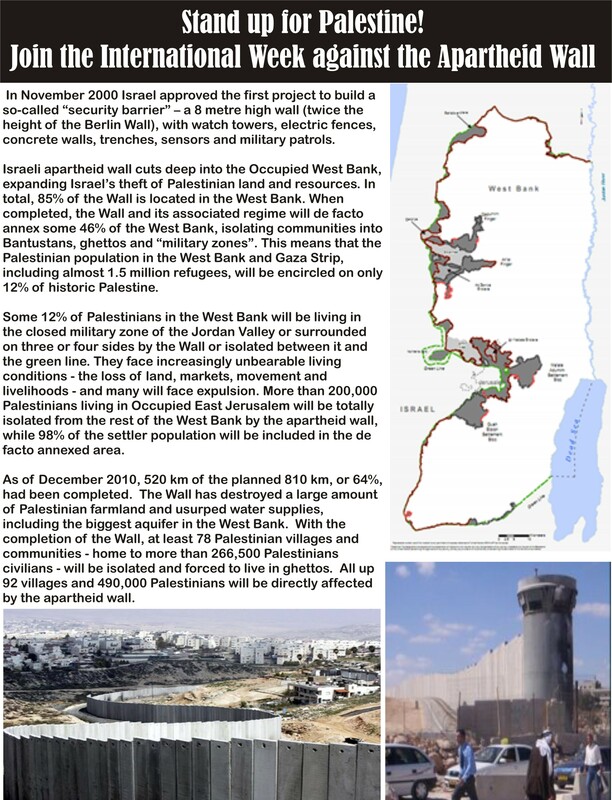 When completed, the Wall and its associated regime will de facto annex some 46% of the West Bank, isolating communities into Bantustans, ghettos and “military zones”. This means that the Palestinian population in the West Bank and Gaza Strip, including almost 1.5 million refugees, will be encircled on only 12% of mandate Palestine. Some 12% of Palestinians in the West Bank will be living in the closed military zone of the Jordan Valley or surrounded on three or four sides by the Wall or isolated between it and the green line. They face increasingly unbearable living conditions – the loss of land, markets, movement and livelihoods – and many will face expulsion. More than 200,000 Palestinians living in Occupied East Jerusalem will be totally isolated from the rest of the West Bank by the apartheid wall, while 98% of the settler population will be included in the de facto annexed areas. As of December 2010, 520 km of the planned 810 km, or 64%, had been completed. The Wall has destroyed a large amount of Palestinian farmland and usurped water supplies, including the biggest aquifer in the West Bank. With the completion of the Wall, at least 78 Palestinian villages and communities, which are home to almost 266, 500 Palestinian civilians will be isolated with a total population of 266,442 will be isolated and forced to live in ghettos. No Australian support for Israel — end all military and economic ties now! 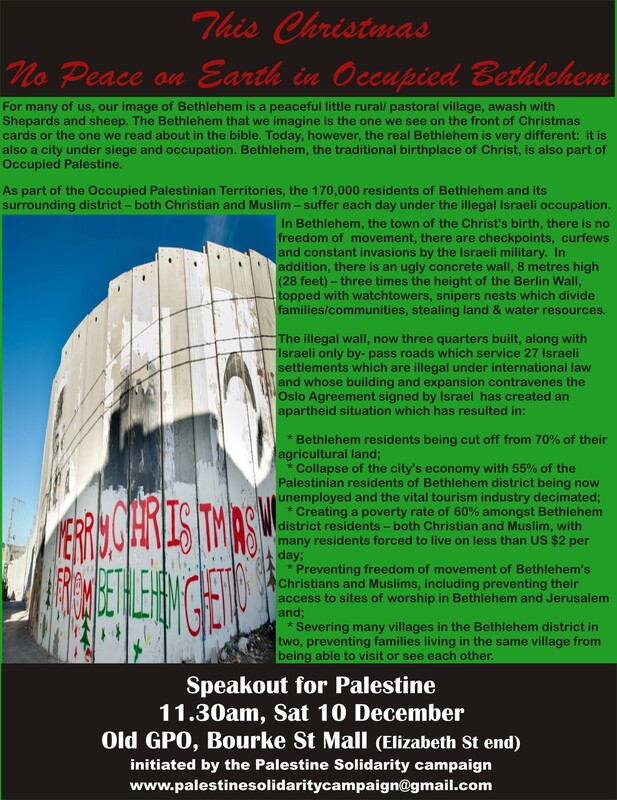 Standup for Palestine: Join the international week against the Apartheid Wall!